The Gemini 4 spacecraft awaits recovery in 1965 with the green marker dye coloring the ocean water. 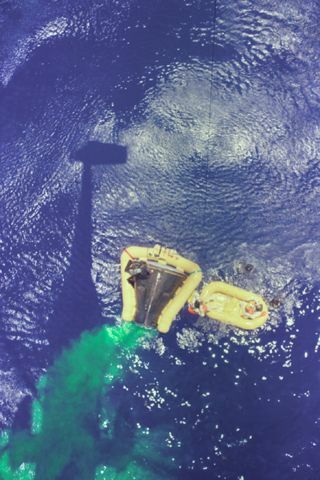 In this historical photo from the U.S. space agency, an overhead view of the Gemini 4 spacecraft shows the yellow flotation collar used to stabilize the spacecraft in choppy seas. The green marker dye is highly visible from the air and is used as a locating aid. A crewmember is being hoisted aboard a U.S. Navy helicopter during recovery operations following the successful four-day, 62 revolution mission highlighted by Ed White's space walk.